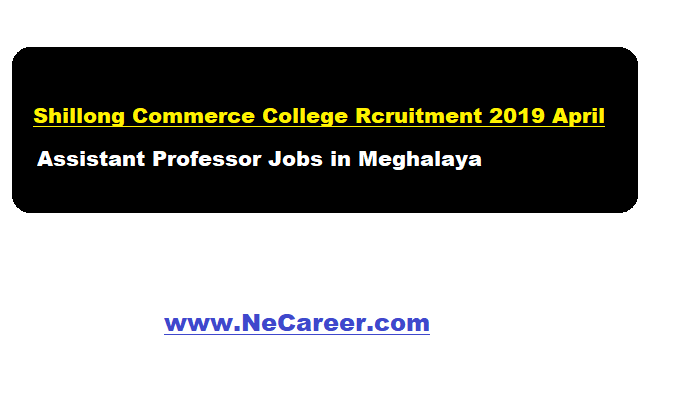 Shillong Commerce College Recruitment 2019 April | Assistant Professor posts :- Welcome to North East India's No. 1 Job Portal NeCareer.com .Shillong Commerce College Meghalaya has issued a job notification in April 2019. According to the recruitment applications are invited for filling up Assistant Professor posts in various disciplines. Qualification/Experience : As per UGC norms. Candidates must have Master’s degree with 55% marks (or an equivalent grade in a point scale wherever grading system is followed) in a relevant/allied subject from an Indian University. Salary: As per UGC norms. Interested and eligible candidates may apply by submitting their application in a Plain Paper along with attested copies of all Academic Qualifications, Experience certificates, etc at the College Office of the Principal, Shillong Commerce College, Boyce Road, Laitumkhrah, Shillong – 793003 on or before the 26th April 2019.